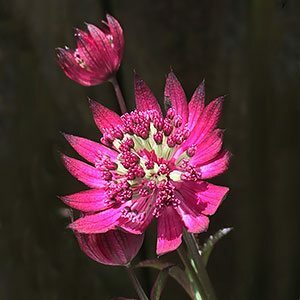 Astrantia are commonly called ‘Masterwort’ and are a wonderful flowering cottage garden plant. One of the great things about these plants is that they thrive in shade. They are also tolerant of a range of soil conditions as long as a little moisture is available. Excellent in a shaded position next to a building, and at home in a container in a shady courtyard. They also grow well beneath deciduous trees. Astrantia major itself has rather subdued flowers, green and white, however many more varieties are available with more colourful flowers, including some with variegated foliage. Some varieties will flower in spring and them flower again in Autumn, Ruby Wedding is one of these. Astrantia are a shade loving plant that do well in a humus rich soil. They will die right back in winter, however they reappear early in spring, foliage and flowers all in the shade. Sometimes called ‘Masterwort’, Astrantia has flowers on tall stems in early summer and can repeat flower if deadheaded. Astrantia are becoming difficult to find in Australia, but well worth seeking out.